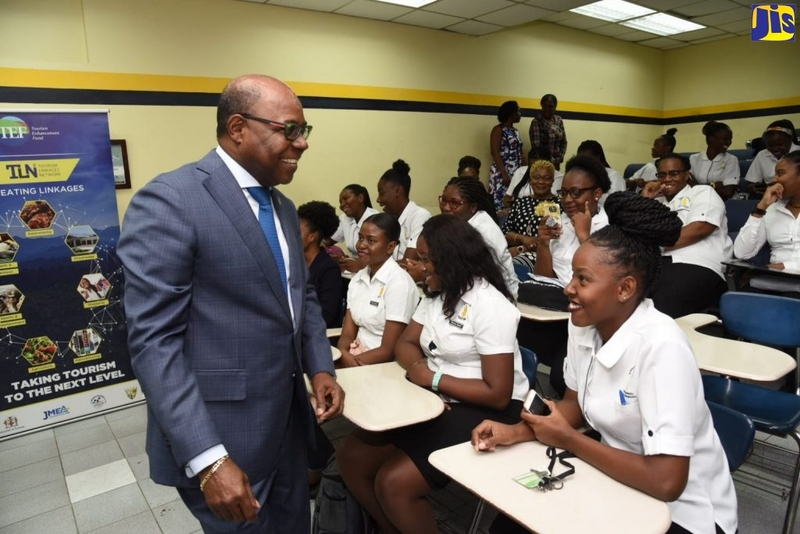 Minister of Labour and Social Security and Member of Parliament for North Central Clarendon, Pearnel Charles, has called on students to “walk in the right lane” and avoid bad company. “The only reason why I am where I am today is because I stood in my lane. I am appealing to you; your future is in your own hands – avoid the bad man lane, the lane of no ambition, and respect your teachers,” Mr. Charles urged. He was addressing the launch of the Jamalco/Lennon High School Mentorship Programme in Clarendon, recently. Speaking at the event, a former mentee and student at the Vere Technical High School in the parish, Shavasha Powell, told the gathering that prior to going on the programme, she was stubborn, disruptive and lacked self-confidence, but through the initiative, she was able to curb her negative attitudes and gain a university scholarship. “I became reliable, hardworking, more determined and persistent. The mentorship programme helped me to elevate myself to be a role model in my community, and to my younger siblings. I have accomplished to the title of ‘Miss Vere Technical’ for 2010. I am one of eight scholarship recipients from the programme, and am now a proud first year student at the Northern Caribbean University,” she boasted. The Jamalco Mentorship Programme was instituted at Vere Technical in 2009 and then extended to the Winston Jones High School in Manchester. Each student on the programme is assigned a mentor, who provides guidance and advice, and the mentees can also benefit from educational grants and tertiary scholarships. “We believe that every child can be rescued. Sometimes, all the child needs is a little attention, a little re-assurance, someone to remind them that they can make it, and so the mentorship programme seeks to ensure that children walk along the straight way,” said Community Relations Officer at Jamalco, Phillip Biggs. Meanwhile, Head of the Jamaica Constabulary Force’s (JCF) Community Safety and Security Branch, Senior Superintendent James Forbes, who delivered the keynote address, said the initiative is one that will bring lasting benefits for the students.